A local station in Winnipeg, Manitoba, reports on a collection of 15 years of photographs from séances in a home in Winnipeg, beginning around 1920, taken by Dr. T.G. Hamilton. Many of the photos show ectoplasm (called “externalized teleplasms” in the news segment). What I found interesting by looking at the ectoplasm photos in the embedded video, is that it appears like 2 of the photos have small faces of people as part of the ectoplasm. I knew that ectoplasm was sometimes described as being used to materialize the discarnate persons but I never heard of only a small part of it being used for creating a face. Of course, I could be seeing wrong, and in any case, we don’t know how it changed over time, which would’ve been even more interesting to see. Researching more on the topic, I found this other article from Manitoba Historical Society describes the visit of Arthur Conan Doyle to Winnipeg in 1923, during which he gave lectures on spiritualism and attended the above-mentioned séance circle. 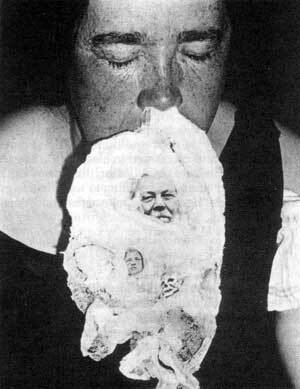 That article includes photographs both of Dr. Thomas Glendenning Hamilton and of the ectoplasm with the “images” of people in it. The article claims that these are absolutely fake. It’s a pretty interesting article, go read it. 1931 photograph of a Winnipeg medium with an “obviously fraudulent ectoplasmic apparition” of Conan Doyle one year after the author’s death.